Most residents and sonographers agree that a thorough understanding of ultrasound physics principles enhances their performance in the clinical setting. However, students often have difficulty in translating textbook physics concepts into their clinical practice. 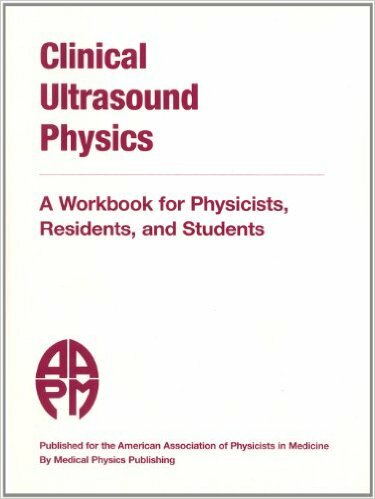 This workbook is presented as an instructor's manual to assist physicists in teaching ultrasound physics concepts to non-physics personnel (residents, sonographers, graduate students, etc.) It outlines several demonstrations and exercises that emphasize the clinical implications of various scan parameter settings, including: power, gain, dynamic range, time-gain compensation, field-of-view, displayed depth, postprocessing, zoom (magnification), Doppler gate angle, Doppler gate size, Doppler gate position, and color flow imaging. There are discussions, where appropriate, on the effect of these parameters on resolution (axial and lateral), frame rate, depth of penetration, blood flow velocity, and overall image appearance. Demonstrations and discussion are also provided for harmonic imaging and aliasing in Doppler ultrasound as well as ultrasound safety considerations and biological effects. Introductory physics concepts are provided along with sample data and images. Additionally, possible discrepancies between measured and "theoretical" results are explained, with attention focused on relationships and trends. The concepts and equations provide starting points for discussion and are not a comprehensive review of clinical ultrasound physics. Each section is organized into four topics: Scope and the Purpose, Background and Theory, Test Procedure, and Sample Data and Discussion, which discloses the expected results of the test procedure. Readers who think they are familiar with the theory can start with the test procedure. If you do not get results comparable to those reported in the workbook, you may wish to review the Background section. On the other hand, sonographers and radiology residents preparing for examinations may wish to only read the Background and Theory section. The equipment needed to perform all the demonstrations is available in any clinical ultrasound environment. However, some of the concepts are best illustrated with quantitative measurements. Therefore, we suggest using an ultrasound quality assurance (QA) phantom that contains resolution targets for these demonstrations. Phantoms with a speed of sound of 1540 m/s are recommended when acquiring quantitative data. Any other phantoms may be used for demonstrative purposes but may not give the same results as the recommended phantoms. Appendix C contains data sheets and plot templates for your use.